I went with the obvious colour scheme, due to the name of the quilt block. Don't let that keep you from using any variety of colours in your block, as long as there are definite lights and darks. 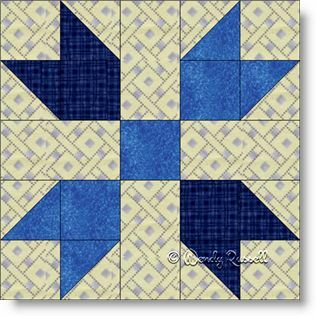 The Bluebonnet quilt block is a five patch block (because it is made on a 5 x 5 grid), but rather than construct the block as five separate rows, my preference is to sew it as an uneven nine patch. Feel free to use whichever method you are most comfortable with as it really is just a matter of choice. This is an easy block using simple shapes -- squares, rectangles and half square triangles. The sample quilts illustrated give you ideas for the design of your quilt, and show a straight setting with sashing and an on point layout, and thereby making two very different looks. Rotations also can play a part in the block placement in your quilt, which will create subtle secondary patterns, as you will see in the sample quilts shown.